A group of residents say they may have the signatures to challenge the rate hike, which has been proposed to help the district keep up with natural gas expansion. HALLOWELL — The local water district’s proposed 20 percent rate increase may be delayed by Maine utility regulators after a citizen-initiated challenge to the hike. Last month, the Hallowell Water District had a public meeting on the proposed hike for commercial, residential and other users. Dennis Kinney, the district’s superintendent, has blamed the proposed hike on the rising cost of keeping up with natural gas expansion in the city. As of now, the district’s proposed change would be effective on July 1. But that could be pushed back, as a group of residents led by Larry Morrisette, of Page Street, say they have gathered enough signatures from customers to force a review from the Maine Public Utilities Commission. The rate hike would generate nearly $76,000 more per year for the district, funding the salary and associated costs for a new employee, who would be dedicated to Hallowell’s district but contracted through the Gardiner Water District. That employee started work May 18, said Kinney, who was the district’s only employee before then. After the change, customers using up to 1,200 cubic feet of water every three months would see bills rise to a minimum of $66, up from $55 now. Normally, the increase wouldn’t be subject to review from the state utilities commission. However, state law allows for a financial review of the district when 15 percent of the district’s customers sign a petition demanding one. That would immediately suspend the hike, said Harry Lanphear, spokesman for the utilities commission, which would have nine months to investigate the district’s total financial picture. The Hallowell Water District reported having 823 customers in its 2013 annual report submitted to the utilities commission. At that total, 124 people must sign the petition. Morrisette said his group of customers has collected about that many so far, but they are getting more ahead of the submission deadline later this week. Morrisette said overwhelmingly, petition-signers aren’t “chasing bad guys” and appreciate Kinney’s work. Still, he said they are concerned about his justification for the increase. For example, many don’t know why Kinney wants a year-round employee when natural gas construction is going on for only part of the year. “We wanted to make sure the reason behind the increase was solid and justified,” Morrisette said. 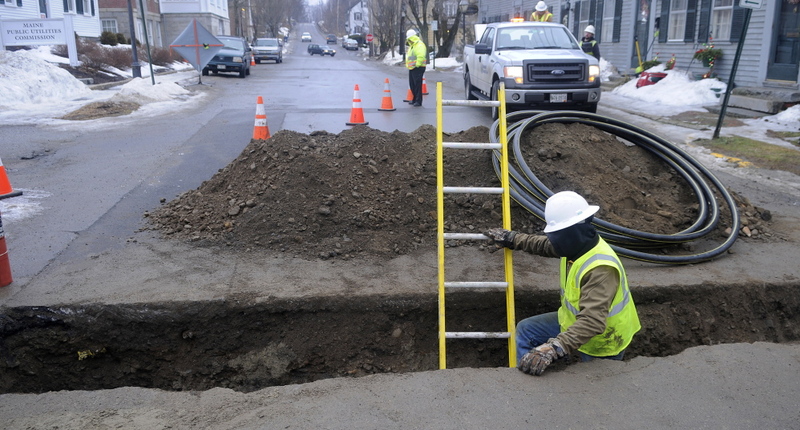 Natural gas expansion throughout the Kennebec Valley has stretched local utility districts. In 2013, the Greater Augusta Utility District responded to nearly 3,000 requests to mark existing utility lines for natural gas crews — about five times more than the year before. There are no plans for a rate increase there, but Hallowell’s tiny district hasn’t been able to absorb those costs as easily, Kinney has said. Plus, Summit Natural Gas of Maine plans to install lines past most homes in Hallowell on the east side of the Maine Turnpike this year. Natural gas work in the city last year led Kinney to push back operations and maintenance because he had to track existing lines. The new employee will be tasked with locating lines, while Kinney focuses on catching up, because “at some point in time, we need to get that work done,” he said. “I don’t know where these consumers think I’ve got this time,” he said.